Recently Red Lobster has been in the news, there were some internet rumors recently that the chain would close down. While it is false the chain is closing down, it may be sold from their parent company, Darden. Darden is the largest restaurant company in the world and they have some of the most loved brands. One can wonder if in the future our favorites will be around. Personally, for me there are a few items I really enjoy at the Red Lobster, their biscuits are some of the best around. Honestly, I can’t think of a better biscuit than one of theirs. Hot, buttery, and fluffy they are so hard to resist. 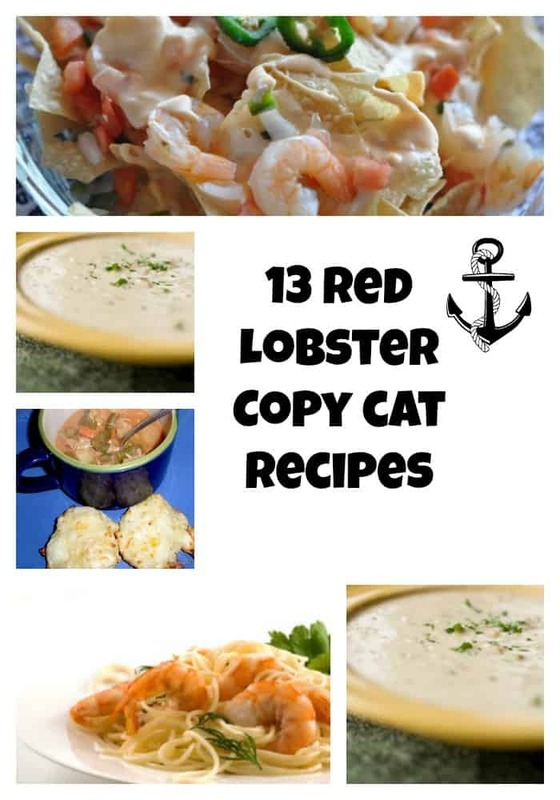 I will share with you one a couple of different copy cat recipes one is even gluten-free. Gluten-Free Red Lobster Knock Off Biscuits by GlutenFreeEasily.com. Once you sit down and enjoy a biscuit or two it’s time for some of their famous appetizers. To this I give you their seafood nachos, and their coconut bay shrimp. With the Super Bowl coming up soon, nachos naturally come to mind. Red Lobster Shrimp Nachos by CopyKat.com. I think most things go better with bacon, here are their famous bacon wrapped scallops. Now let’s move on to the entrees. One of my favorites is their Crab Alfredo, now if you don’t have crab, you may want to substitute shrimp for this dish. Red Lobster Pumpkin Pie In a Jar by ahenenet.com. Red Lobster Chocolate Lava Cakes by RainingHotcoupons.com. I don’t have that recipe, thank you for the suggestion. Hi Stephanie, I loved the older version of Red Lobsters Sweet and Sour Sauce. I didn’t care for the newer recipe. Do you have the older one ? Thank you Barbara, I am sorry I never tried their Sweet and Sour sauce before. So I don’t happen to have an older version, but I will keep my eyes open for it! I am dying for the Red Lobster Dragon Shrimp recipe. Just had the Caprese Salad. The dressing was lick the bowl delish. Anyone know whats in it? Stephanie, do you have the recipe for Red Lobster’s Lobster Dip? Thanks, it is really awesome! I am also looking for a recipe for Red Lobster’s French Salad Dressing. My husband loves it! Do you have a recipe for Red Lobster’s French Salad dressing. It is delicious. I wish they sold it. Would like recipe for red lobster biscuits and champagne vinegarette dressing. Do you have the recipe for Red Lobster’s 1000 Island Dressing? I figured out to add 1T honey to 1000 dressing. It tasted the same. Hi Stephanie: Did you by chance figure out the recipe for Red Lobster whipped sweet potatoes yet? I am REALLY wanting this recipe so I can fake my wife out and make something she thinks I can’t!! If possible, please provide the recipe for Red Lobster”s Bay Harbor lobster bake which contains small Maine lobster tails,shrimp,scallops,mussells and tomatoes over a bed of linguini in white wine sauce. Any help you give will be GREATLY appreciated. Thank you in advance! Thank you, I will see what I can do. I had the most amazing Whipped Sweet Potatoes topped with pecans at Red Lobster. Do you have the recipe? I had them last night and can’t stop thinking about them. They were the best part of the meal – even better than the Cheddar Bay biscuits, which is saying a lot. I hope someone comes up with the copycat recipe soon! I just had these the other night, and I, too, can’t stop thinking about them. I thought I also tasted a hint of a really light fluffy marshmallow-butter?…or what was the white dabs on it? I also want the recipe for these. They are so good (& not the same as the Bourbon Pecan Sweet Potatoes)! I hope Stephanie has this recipe soon since they ate a limited time item! …*are* a limited time item. I felt the same way about these whipped sweet potatoes!! I thought for sure there was some exotic ingredient or interesting preperation method. I have been searching for a copycat recipe, and just decided to call the local red lobsters in my area and ask if they sell ‘catering size’ of this dish for dinner parties OR would they be willing to share the recipe. It isn’t their recipe! I just found out from a Red Lobster manager that these are actually Stouffer’s whipped sweet potatoes from the grocery store! They just add a pat of real butter and their candied pecans. The manager said you can make your own candied pecans by using just honey roasted pecans that you roast in the oven yourself in butter/brown sugar/cinnamon or whatever you like to add as a topping. Thank you so much for this! I cannot seem to find Stouffer’s whipped sweet potatoes anywhere… do you know where they carry them? I haven’t seen them. They may offer that to restaurants only. I will see what I can do about doing this recipe before the holidays. Hi Stephanie I was wondering if you had this recipe for the whipped sweet potatoes from Red Lobster. Please please can I get this from you? Soo glad I’m not the only one who can’t stop thinking about those amazing sweet potatoes. Thanks for the answer Michelle. Stephanie – Do you have a recipe for Red Lobsters Tarter Sauce? So glad I’m not the only one who can’t stop thinking about those amazing sweet potatoes. Thanks for the answer Michelle. I don’t have this recipe ready yet. I am working on it right now. The recipe will not be available for Thanksgiving. Do you have a recipe for Red Lobster’s original key lime pie? They changed the recipe about 15 years ago and I have never been able to find something remotely close to the original. Do you have a recipe for Red Lobster’s Thousand Island sales dressing? I’m desperately seeking two recipes and can’t seem to find them! One is the lobster sauce used by Olive Garden for some of their pastas (that they took off the menu much to my disappointment). The other is the shrimp lettuce wraps that we just tried at Red Lobster. Both are AMAZING. Any suggestions on those? I’ve been looking for that recipe (shrimp lettuce wraps) myself, but haven’t been able to find it. Can you help?